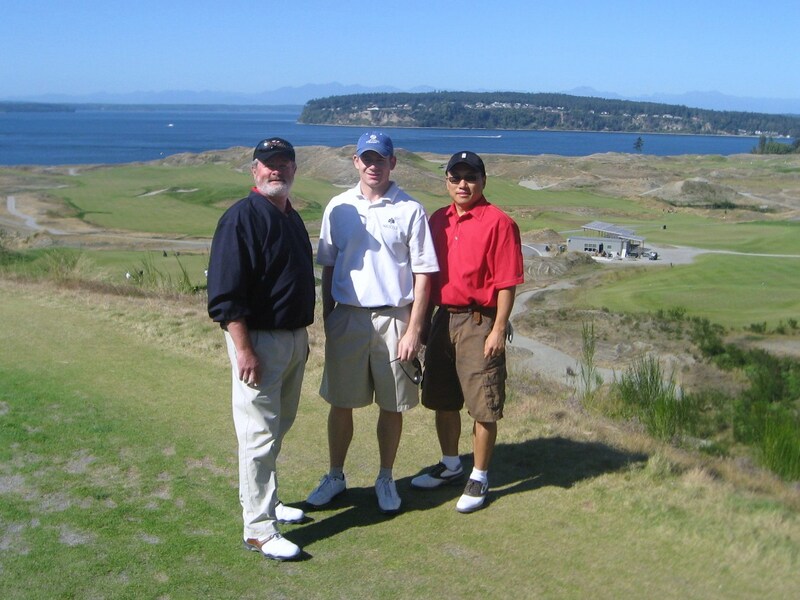 The first ever gathering of The Walking Golfers Society occurred at Chambers Bay on September 27th, 2009. As you can see from the photos below, it was a spectacular day and a fun time was had by all. Big thanks to all of the Society members who attended – it was great to meet everyone. The Walking Golfers Society would like to thank Nyk Pike and the team at Chambers Bay for hosting us and providing the members with really cool Chambers Bay/TWG logo hats! The Society would also like to thank Todd Rohrer and The MacKenzie Golf Bag Company for providing us with several beautifully hand-made leather headcovers and valuable pouches for prizes. 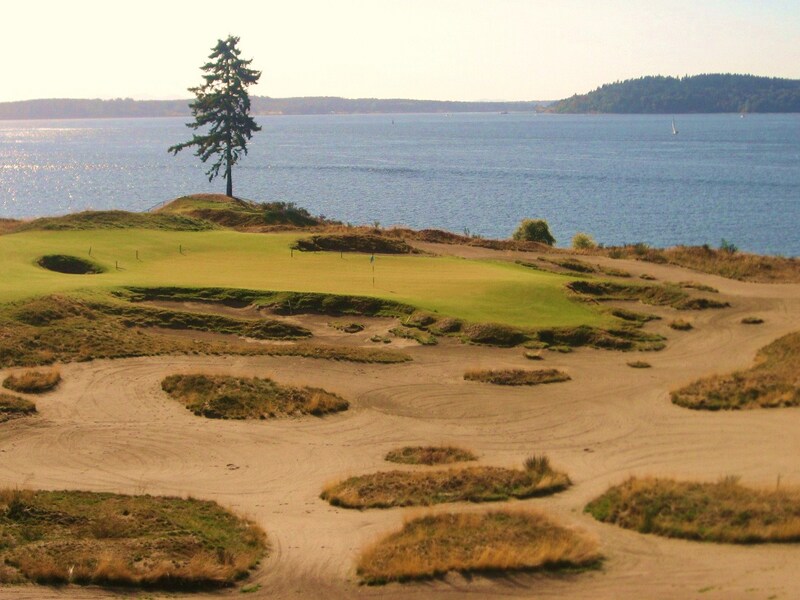 The Walking Golfer reviewed Chambers Bay earlier this year, but there are a few photos below which illustrate the changes that have occurred at the course over the summer. 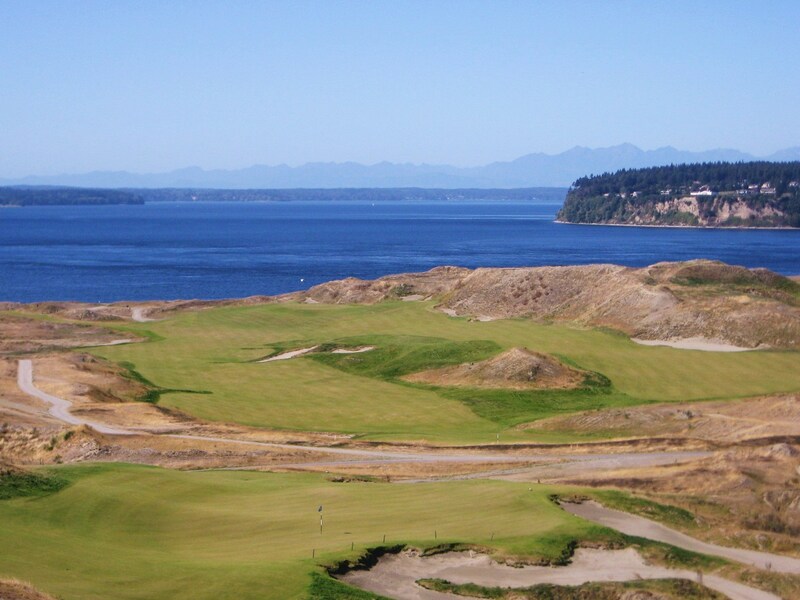 Chambers Bay is located on the Puget Sound, and on a clear day you can see the Olympic Mountains in the distance – a spectacular sight. Allen and Cedar were visiting Chambers for the first time – fantastic timing. Cedar played his most consistent round of the year, posted a great score and took home a gorgeous leather valuables pouch – Congrats Cedar! Peter, Rob and Rich on the tee at the one shot Ninth. 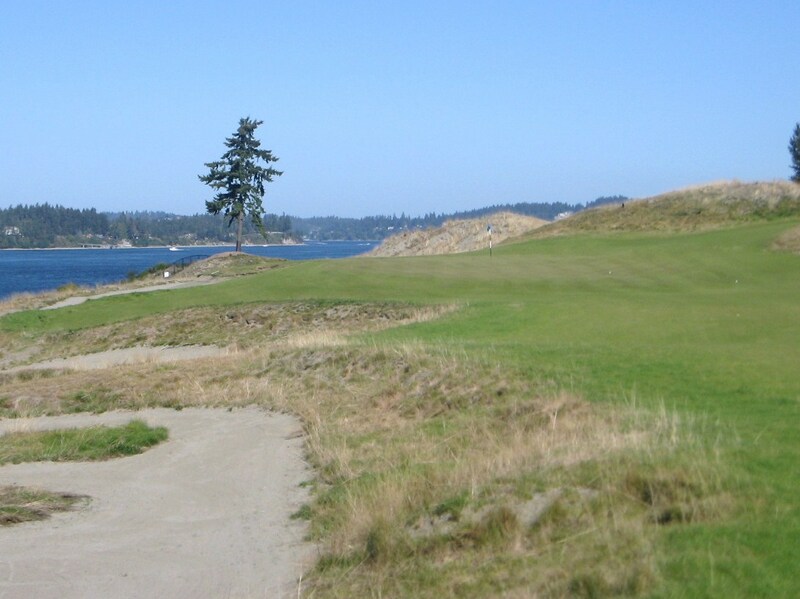 Peter and I both grew up in Ontario where links golf is not an option, so Chambers Bay is always a real treat. Bu do not feel too sorry for us, we were fortunate enough to call a couple of Stanley Thompson courses “home”. 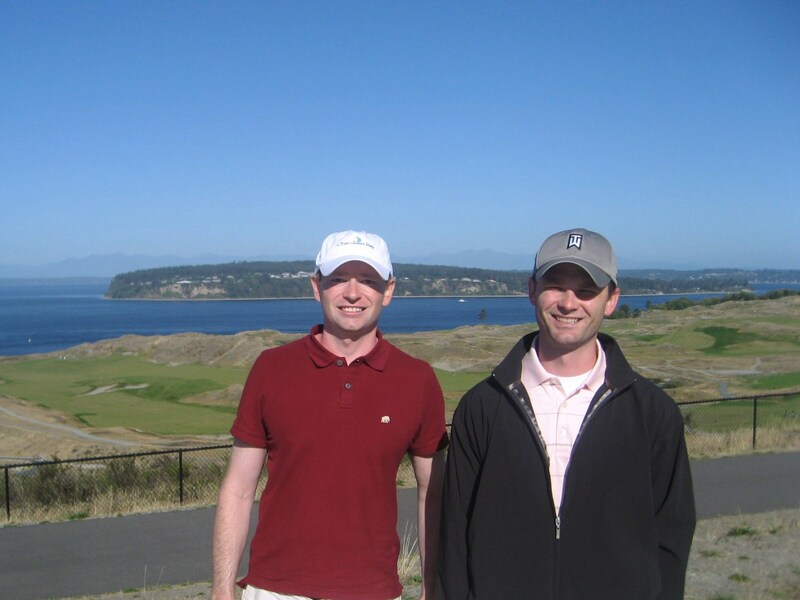 Rich drove down from Seattle for his 17th round at Chambers Bay – needless to say he was the Sherpa for the day. Unfortunately a few of the guys did not make it on camera – next time lads! 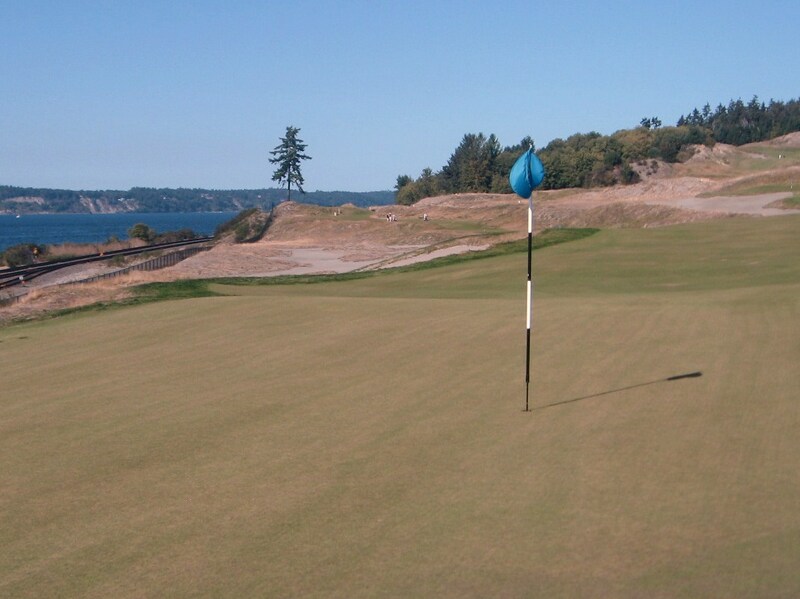 The greens at Chambers Bay have been getting better and better this summer and the maintenance crew have done a great job of blending the fairways and greens in an almost seamless manner. As Rich pointed out, RTJ II and his team did something very interesting with the bunkers. 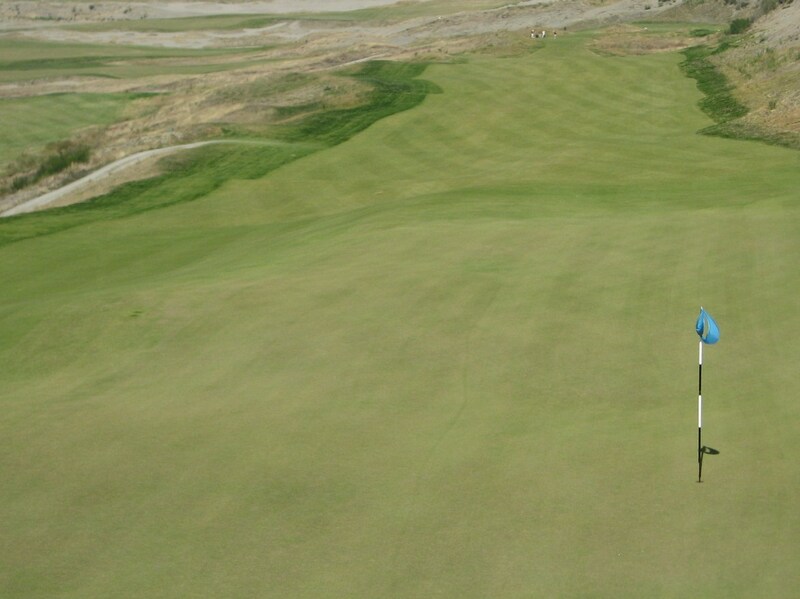 Unlike at most courses, the grass does not only provide “walls” but also part of the “floor”. This can create some unique and challenging lies within the bunker footprint. Looking back on the three shot 8th it is evident how firm and fast the course is playing this summer – perfect golfing conditions. The greens were also running around nine on the stimpmeter which was a great pace for fescue based putting surfaces which, at times, have a lot of movement. 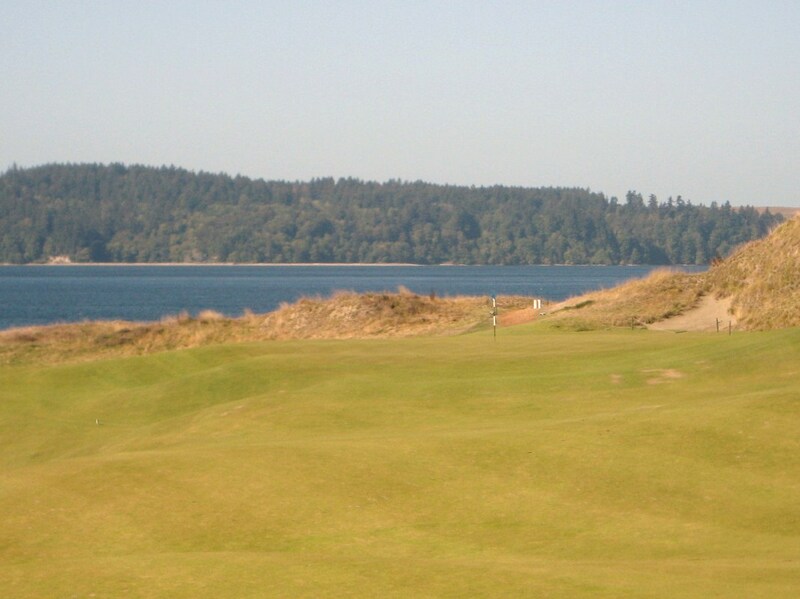 View from the 9th tee with the green below, along with the 1st and 18th, the Sound and the Olympic Mountains in the distance. The USGA is growing in the rough for the 2010 US Amateur Championship which will be contested at Chambers next summer. The dark rough patches are obvious below. 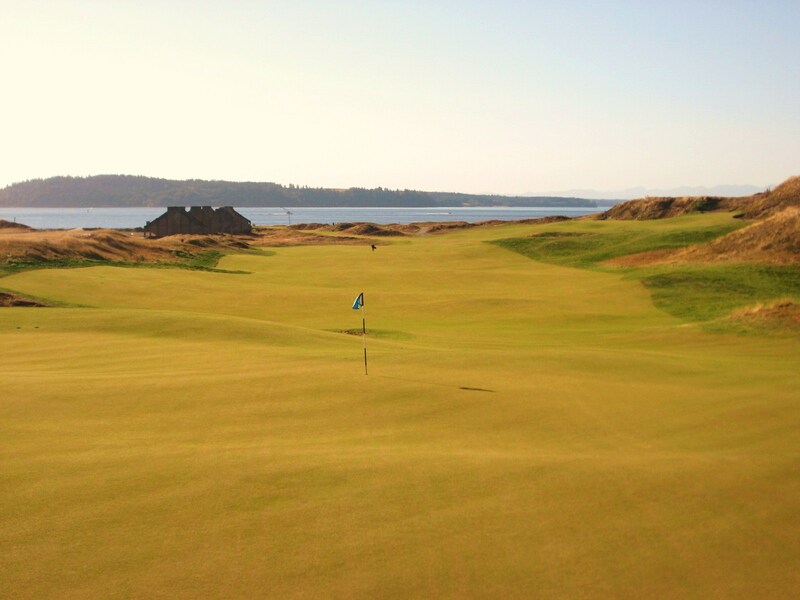 The 10th was a big favorite of the group, it probably has the most “Irish links” feel of any hole on the course because of the two surrounding dunes that create a fabulous corridor to play through. The tee shot on the two shot 14th is “all world”. 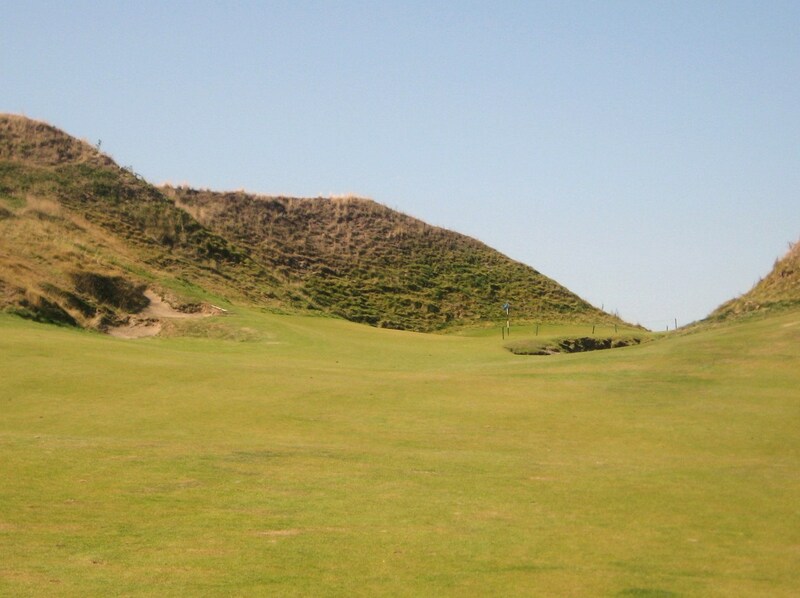 A draw off the bunker in the distance will set you up for a short iron approach, but anything too short will force a punch out of the waste area and anything right of the bunker will leave a challenging long iron to the green. A fantastic hole. The Lone Fir stands behind the 15th green. 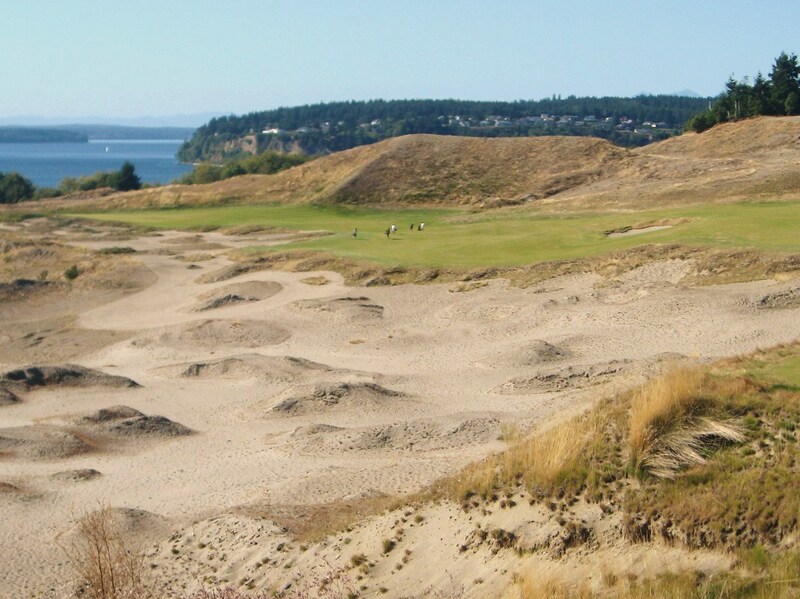 We might see this vista once or twice during the 2015 US Open . . . Looking back from the 16th green it is possible to see the railway tracks that lie between the course and the Sound. 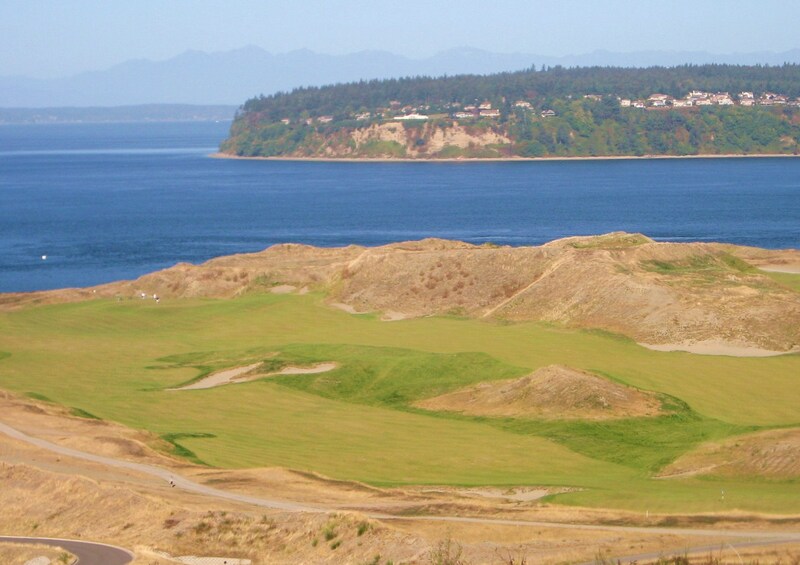 A stop at Chambers may be implemented to help ferry spectators to and from the surrounding area during the US Open. The 18th is a solid finishing hole with a very finicky green, especially if the flag is located precariously on the top of a ridge as it was on the day we visited. The lone walker in the distance is probably Andrew, who took home a beautiful leather fairway wood headcover for low gross. Well done mate. This was a beautiful day on the links. How about a 2010 gathering!? !